Heavy is the head that wears the crown, or in this case, clicks the mouse. Such is life in developer, Eat Create Sleeps’ early access God sim, Crest. Following a successful run on Indiegogo, the game was released on Steam Early Access in 2015. The devs have continued development, frequently adding new features and gameplay modules over the years. Unlike in typical God sims, Crest only lets players believe they are the ones in control. 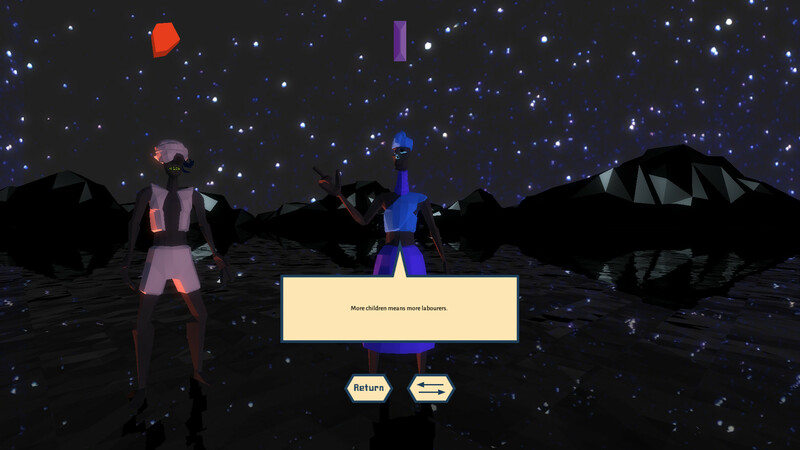 The reality of their omnipotence, or lack thereof, adds depth to this low-poly experience. Crest is an Afrofuturist game featuring an advanced iron age civilization set in African inspired biomes. Players must steer their followers down the path of survival. Followers who have free will and changing dispositions towards both you, their God, and the world you want them to build. This can lead to vastly different interpretations of your wishes as time goes on. Wait, child slavery, yay or nay? It is this controlled chaos that gives Crest the most promise. Players are able to influence their followers by issuing commandments. From there followers will interpret and carry out their orders based on their own motivations. As the world grows so do the consequences of your choices. You can try to change a poorly worded commandment to correct its outcome, but doing so will cause your followers to lose faith in you. It’s a constant pull between commands and compromise that will ultimately determine your legacy. Players start each session with a unique world which they must mold and shape to their whims. The lack of multiple save states adds weight to your choices as you attempt to guide your followers to salvation. If all your followers in a world die out, then that world is lost forever. Its history is archived by the Chronicler of the Underworld so players can learn from their previous trials and triumphs. Of course, the game is still in development, but the premise of taking on the role of deity without the benefit of assured compliance is intriguing. Guess we’ll see how much weight thoughts and prayers can really have over the minds of men. Check it out for yourself on Steam.